The web page has been updated with some new functions and an english reference-list ! Between 2009 July 20-24. ELCOM and FETIKÖVIZIG has started the yearly repair and maintenance works on Hungarian-Ukrainian Common Remote Water Management Network. Welcome on ELCOM's new homepage. We maintained this site to show the world who we are, to show our previous works we are proud of, our references, and some more of our company that you may didn't know yet. We hope you enjoy the tour, and please don't hesitate to contact us if you have any questions! © 2009-2019., ELCOM Kft. 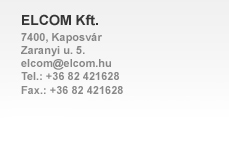 All Rights Reserved | Web development: Elcom Kft.